June was an awesome month for xorsyst.com! Thanks to all the new readers and fans! Not only did I see the best month ever in terms of traffic, but we more than doubled May’s traffic, and shattered my previous goal of 200,000 page views for June. 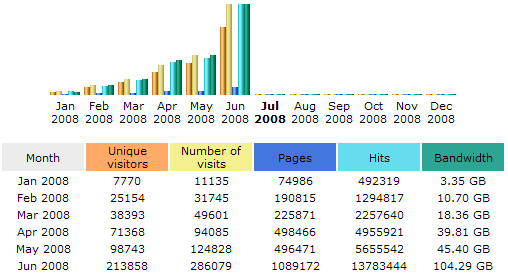 xorsyst.com served over a quarter million page views for June 2008! xorsyst.com saw 282,429 page views and 213,858 unique visitors. That’s way more than I expected to see for June, but I’m not complaining at all! 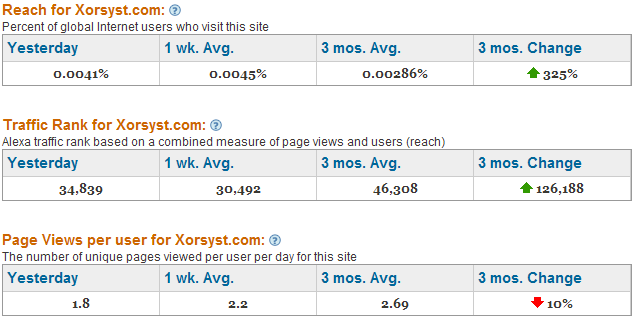 With the dramatic increase of traffic, I’m seeing a lot of new referrers bringing traffic to xorsyst.com. Thanks to all the sites linking to posts here on xorsyst.com! Stumbleupon traffic has picked up as well for June. I would like to give special thanks to EscapeTheory, WaferLove, and fallensieg for submitting my pages to Stumbleupon. Check out their stumbles and add them as a friend! My Alexa traffic ranking is continuing to improve as well. As I write this, my Alexa traffic ranking is 46,308 with a 1 week average at around 30,492. I am starting to approach my real average which I am very happy about. Also, RSS subscribers are also up at about 410 readers. Along with lots of new visitors, we have also got a new sponsor. BigPfeiffer Collectibles specializes in toys and figures from Japan. Their stock is growing daily, and features everything from Gundam kits to gashapon. Stay up to date with the new BigPfeiffer’sÂ releases and preorders at their blog. The Blanc Neige PVC statue from Shining Tears x Wind is impressive. You can almost feel the cold she gives off. You may also want to check out the Bleach Gashapon if you like keychains or phone charms. Quite a bit of detail, and very affordable too. Definitely check out BigPfeiffer Collectibles.